"At the Benedictine Saint Benedict Abbey of Fleury (now Saint-Benoît-sur-Loire), these antiphons were recited by the abbot and other abbey leaders in descending rank, and then a gift was given to each member of the community. By the eighth century, they were in use in the liturgical celebrations in Rome. The usage of the "O Antiphons" was so prevalent in monasteries that the phrases "Keep your O" and "The Great O Antiphons" were common parlance. One may thereby conclude that in some fashion the "O Antiphons" have been part of Western liturgical tradition since the very early Church. The Benedictine monks arranged these antiphons with a definite purpose. 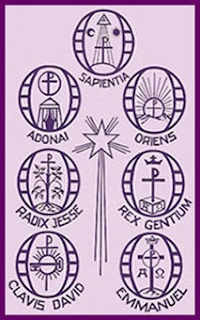 If one starts with the last title and takes the first letter of each one—Emmanuel, Rex, Oriens, Clavis, Radix, Adonai, Sapientia—the Latin words ero cras are formed, meaning, "Tomorrow, I will come". Therefore Jesus, whose coming Christians have prepared for in Advent and whom they have addressed in these seven Messianic titles, now speaks to them: "Tomorrow, I will come." So the "O Antiphons" not only bring intensity to their Advent preparation, but bring it to a joyful conclusion." This has been a tradition in our home since my oldest children were very young and they look forward to it every year. It is such a fun way to teach the children about them and increase their excitement and anticipation as Christmas gets closer! I've posted our special treats and activities for the past few years at Shower of Roses, but I thought I would combine all of the "food" related treats into a post here at Catholic Cuisine. You can find even more ideas in Jenn's O Antiphon post in the archives. O Wisdom that comest out of the mouth of the Most High, that reachest from one end to another, and orderest all things mightily and sweetly, come to teach us the way of prudence! Since the symbol for wisdom is a book, serve a book shaped cookie to each person. You could use a book shaped cookie cutter , create your own template, or even make Bible Cookies out of Fig Newtons! If you are feeling really ambitious, you could even bake a book shaped cake, like Anne's from the feast of St. Gregory, and write the above O Antiphon prayer on the "pages." O Adonai, and Ruler of the house of Israel, Who didst appear unto Moses in the burning bush, and gavest him the law in Sinai, come to redeem us with an outstretched arm! In past years, my family has usually made our Gingerbread houses this day, emphasizing the word "house" in this Antiphon. 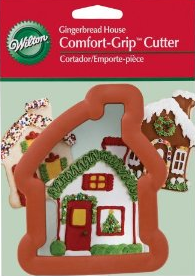 You can purchase kits , or bake your own using the Fox Run Ten Piece Gingerbread House Cookie Cutter Bake Set. Charlotte recommends using melted white chocolate instead of the royal icing that comes with the kit! 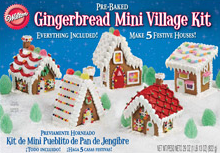 If you would rather avoid the kit, or baking your own gingerbread cookies to build a house, you can also make Gingerbread Graham Cracker Houses. Honey Maid has even come out with Gingerbread Flavored Graham Crackers for a limited time! Looking at the rest of this O Antiphon, you could always tie in "Moses in the burning bush." A couple options can be found in the Jesse "Tea" for Advent including Ten Commandments Cookies! O Root of Jesse, which standest for an ensign of the people, at Whom the kings shall shut their mouths, Whom the Gentiles shall seek, come to deliver us, do not tarry. There are so many root vegetables that can be used for this O Antiphon. You could make a Hearty Beef Stew and serve a Carrot Cake for dessert. Root beer is another perfect option for this O Antiphon! In the past I usually would purchase our Christmas poinsettia (O Root of Jesse/O Flower of Jesse) on this day, and read The Legend of the Poinsettia to our children. This year I am planning on making Poinsettia Cupcakes! 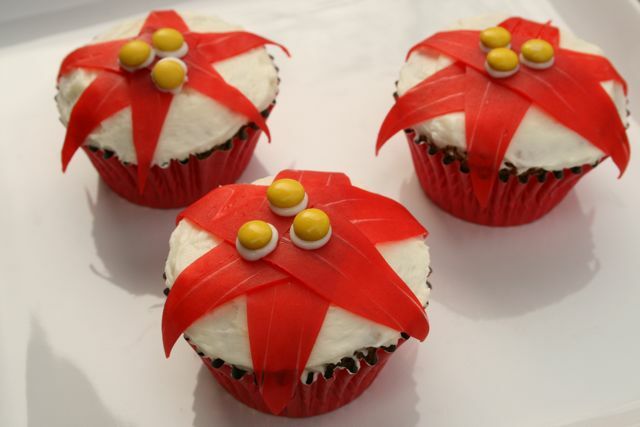 To make these, all you need to do is decorate cupcakes with some triangles of red fruit roll-up, attaching small yellow candies to the top with a bit of extra white frosting. 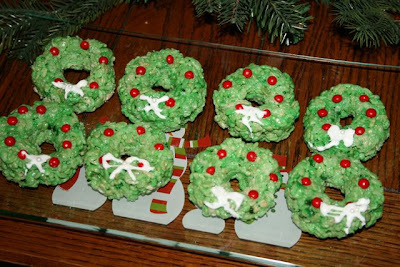 Another option would be to serve Poinsettia Cookies. If you don't have a Poinsettia Cookie Cutter, a Star Shaped Cookie Cutter would work as well. O Key of David, and Sceptre of the house of Israel, that openeth and no man shutteth, and shutteth and no man openeth, come to liberate the prisoner from the prison, and them that sit in darkness, and in the shadow of death. Since this is initially a monastic tradition, and on this night, the monk in charge of the wine cellar would provide a special bottle of wine. We usually have a special drinks with dinner. Costco has a great package of delicious fruit spritzers which our family enjoys. 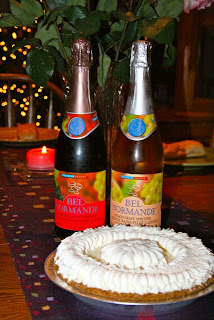 I also usually serve a Marie Calendar's Key Lime Pie, which is quick, easy and delicious. If you'd like to make one from scratch, here is a recipe. Key Lime Cookies or Key Shaped Cookies would also work great! O Dayspring, Brightness of the everlasting light, Son of justice, come to give light to them that sit in darkness and in the shadow of death! Last year, my family enjoyed "O Dayspring Ice Cream" inspired by a Blue Bunny recipe. Place six freezer safe dessert plates in the freezer 30 minutes before serving. For each serving, gently pry segments of a tangerine apart. Place on dessert plate in a "spoke" like circle. Place a 1/4 cup scoop of vanilla ice cream in center of tangerine "spoke"; top with 1 teaspoon orange marmalade. 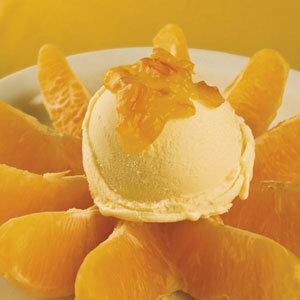 Repeat with remaining tangerines and serve immediately. Charlotte's family enjoyed Texas Sunrises (Tequila Sunrises without the Tequila) last year, and they look like so much fun! Put orange juice in glass. Let it settle on the bottom or stir, as desired. Add ice (optional) if desired. If you'd rather not serve a dessert, what about a Sun Bean Dip? 1 can refried beans, topped with 1 package cream cheese mixed with 1 cup of sour cream and 2 tablespoons of taco seasoning, and then topped with cheddar cheese. 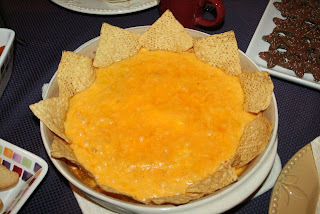 Add chips around edges of dip to form rays, after it has baked. 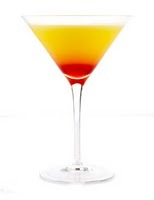 Of course, a glass of orange juice or orange slices cut horizontally would work just perfectly as well. 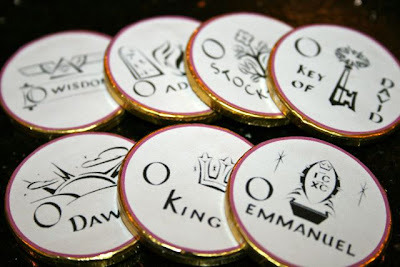 O King of the Gentiles, yea, and desire thereof! O Corner-stone, that makest of two one, come to save man, whom Thou hast made out of the dust of the earth! There are all sorts of ideas for crown sandwiches, cakes and cupcakes in the archives. You could also bake and decorate some crown shaped Christmas Sugar cookies or even make "Crown" Shaped Rice Krispie Wreaths! O Emmanuel, our King and our Law-giver, Longing of the Gentiles, yea, and salvation thereof, come to save us, O Lord our God! 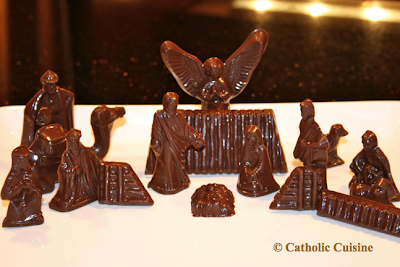 This would be a perfect day to make a Chocolate Nativity Scene to decorate a Birthday Cake for Baby Jesus! Another fun option would be to bake a set of Nativity Cookies using the Fox Run Eighteen Piece Nativity Cookie Cutter Bake Set . 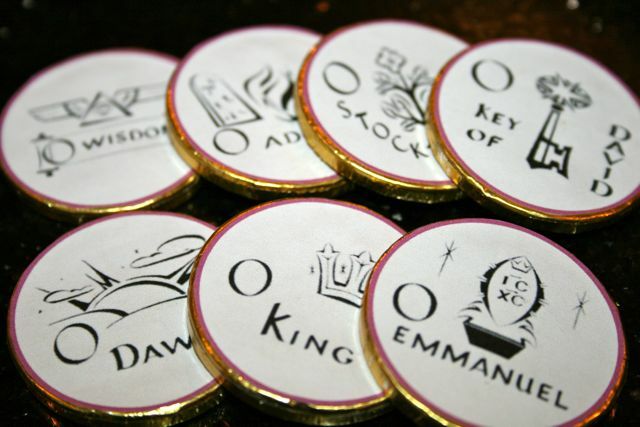 Before I go, don't forget about the O Antiphon Chocolate Coins! You could always make one set for each person in your family and place them next to their dinner plate each night! I had hoped to make a couple other versions (in Latin and Spanish) but I just haven't had the extra time. Oh my gosh! Oh my gosh! My friend is one of the singers on the CD you recommended. We live in Seattle and got to hear this live at the Cathedral a couple of years ago. It's wonderful! And, I love all the other "food" ideas. Wonderful post. Jessica, this is one of your most amazing posts. So many ideas here and all wonderful and symbolic. I only recently read about the old monastic tradition and had been thinking about ways to incorporate it. You saved me a lot of trouble! Between this and the Prayer Companion that Jenn Miller posted with food/treat ideas, I am set. Jessica these ideas are GREAT!!! We have the O Antiphon house which we do with the prayers but I really like the food ideas to add to our tea-time each day. Thank you so much for sharing. When you get a chance can you post the link for the Key-lime pie (made from scratch)?... God Bless. If you take the first letter of each of the O antiphons, it will give the latin sentence : "Ero cras" which means " tomorrow, I will be there".